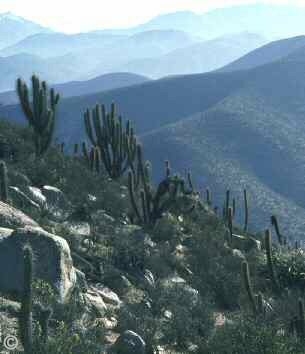 Chinchillas native habitat is the 'Cordillera de Los Andes' - The Andes Mountain Range, which is situated along the western side of South America. 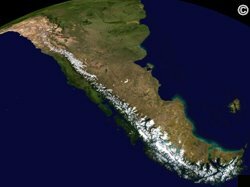 The mountain range is vast expanding 5,500 miles and covers various countries such as Peru, Bolivia, Ecuador, Colombia and Chile. Chinchillas habitat in ranges from 3,000 - 15,000 feet above sea level where humidity is low facing the Pacific Ocean. The Andes climate is harsh, windy and cold reflecting in a dry, rocky and sparse terrain. The mountain is covered by volcanic ash (which chinchillas use to bathe in) and only shrubs, grass, seeds and particular cacti grow. The chinchillas preferred habitat are burrows and rock crevices where they can hide from predators such as birds of prey and mountain lions but snakes, who also share the same habitat area as chinchillas, also prove a difficult enemy to avoid. Wild chinchillas live in herds (also known as colonies) of 14 - 100 chinchillas in their natural habitat, not only for social interactions, but also to help guard against the type of predators mentioned above. Wild chinchillas would adopt a 'look-out' chinchilla who would stay alert to potential threats as the colony emerged from their burrows to feed and play. Chinchillas would sleep in the rocks and crevices in the hot daylight hours and explore during the night when it was cool and much safer to find food to eat. 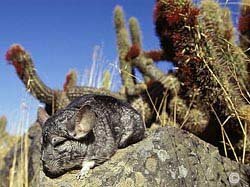 In the chinchilla's original habitat their diet is very bland, mainly feeding off the sparse vegetation such as shrubs, cacti, berries and grass and they consume water from the dew found on the rocks and shrubs in the early morning (as sunrise emerges). Due to their dense fur, chinchillas became popular within the fur industry during the 1500's. Spanish explorers invaded the native habitat of the chinchillas to capture as many as possible and make items of clothing for the rich people. They were unsuccessful in this raid as the Spaniards were unknowledgeable to the fact chinchillas are highly sensitive animals and do not respond well to travel and stress causing most to die prematurely. The story of how the wild chinchilla was deported from their original habitat into the chinchilla industry as we know of today is somewhat controversial. Controversial in the fact that there are two outlooks on the story. One being the romantic story, which ultimately gave us the gorgeous pet chinchilla we know of today and the opposing side of the story that reflects chinchillas were taken from their original habitat when already near extinction and bred in captivity for the purposes of the fur industry. Which side of the story you decide to take is up to you...but this is an unbiased account of the story from 1918. It was in 1918 that a mining engineer called Mathias F. Chapman saw his first chinchilla during a visit to The Andes. He fell in love with (romantic side)....He became interested in for profit (opposing side)... the small bundles of fluff and convinced a local indian to sell him one. Mathias Chapman wanted to create a herd of his own chinchillas but since the 1920's the wild chinchilla had been placed on the endangered species list due to the pelt trade and were now under threat of extinction. A treaty between Chile, Argentina, Bolivia and Peru, who were the main exporters of chinchilla fur, banned hunting and the commercialization of chinchillas who were by now protected under law. Chapman approached the Chilean Government and after much persistence was granted the permission to take chinchillas from their native habitat for transportation to America. 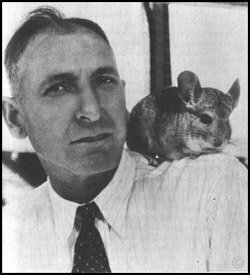 He and 23 men ventured into the chinchilla habitat but as chinchillas were nearly extinct, it took 3 years to catch just 11 chinchillas - although for Chapman's purposes (transportation and breeding), this was enough to start a herd of his own as 3 chinchillas were female. Chapman was aware of the problems the Spaniards had faced when they tried to capture chinchillas, which consequently died during quick transportation and decided to plan his route more slowly. Cages were made for traveling and Chapman collected as much natural food from the chinchilla's habitat as possible. The chinchillas were kept out of the sunlight hours and allowed to feed off the vegetation collected. Chapman noticed his chinchillas were in a stable condition within their cages and decided it was time to attempt the journey home to Los Angeles. He collected more vegetation from the chinchilla's habitat so he could try and replicate the nutritional values and make a similar provision back home. Chapman knew the journey had to be slow so the chinchillas would not become stressed during the changes of altitude during their decent down 10,000 ft of Andes Mountain Range, that they started their journey in 1922 and finally reached the bottom 12 months later! The chinchillas had all survived the initial stages of the journey so Chapman knew so far he had got things right unlike the previous Spaniards. 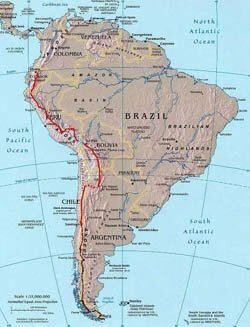 The next part of the journey took chapman and his wife to Callao via a coastal steamer where they embarked on the final and most problematic part of the journey to San Pedro in California via a Japanese freighter. During the flight Chapman and his wife made sure the chinchillas were kept cool with ice-packs and wet towels over the cages. The flight was mostly a success although sadly, one chinchilla died yet another two were born. Chapman arrived in California on 22nd February 1923 and finally settled in Los Angeles. It is from these 11 chinchillas that were bought from their native habitat into captivity, with which Chapman set up the first successful fur farming industry in 1923. Over the forthcoming decades further chinchilla ranches were set up over the US, in Canada and in Europe - there are no chinchilla ranches in the UK due to legislation prohibiting the breeding of chinchillas for use within the fur trade. There is a story that the eighth chinchilla Chapman caught, was named 'Old Hoff' after a German blacksmith who built the original transportation cages and he lived to be 22 years - a great achievement for Mathias F. Chapman - the first man to ever successfully transport chinchillas. Today, wild chinchillas are only known to exist in Chile and are still enlisted on the 'Endangered Species List' due to past hunting and today's threats to their natural habitat - destruction. The plight of the wild chinchilla demise is internationally recognized. In 2001 approximately 12 brevicaudata chinchillas, which were thought to be extinct in the wild, were rediscovered in the regions of Chile. The Langiera chinchilla, although continue to thrive in captivity for the pet and fur trade, have dwindled in their original habitat due to the destruction of the algarobilia shrub in the lower regions of The Andes Mountain Range. As of 2008 they are listed on the 'Critically Endangered List' with fewer than 10,000 surviving in the wild. Attempts at reintroducing the human bred chinchilla back in to the wild have, so far, been unsuccessful. you to take their reading. Photo Copyright: , , , .